The ownership on a deposit can be shared between several users (like co-authors, for instance). A shared deposit is available in each user’s individual space, thus allowing them to view statistics, among other things. Ownership sharing is useful to avoid duplicate entries. Ownership sharing is managed through My Space/My shared ownerships. If there is more than one user with whom you want to share the deposit, go through the procedure for each user. You may receive an ownership request. Ownership requests appear in My Space/My shared ownerships. Click on the action you want. To request ownership on a deposit you didn’t make, go to My Space/My shared ownerships. Enter the HAL identifier for the deposit (id-format hal-00000000) and next send your request. The tab titled “View the requests I sent” lists your ownership requests. You automatically get ownership of an online repository if HAL identifies you as the author of the published publication: either because your idHAL is used in the repository or the author form of the repository includes your first name, last name and e-mail address identical to the information of your profile. 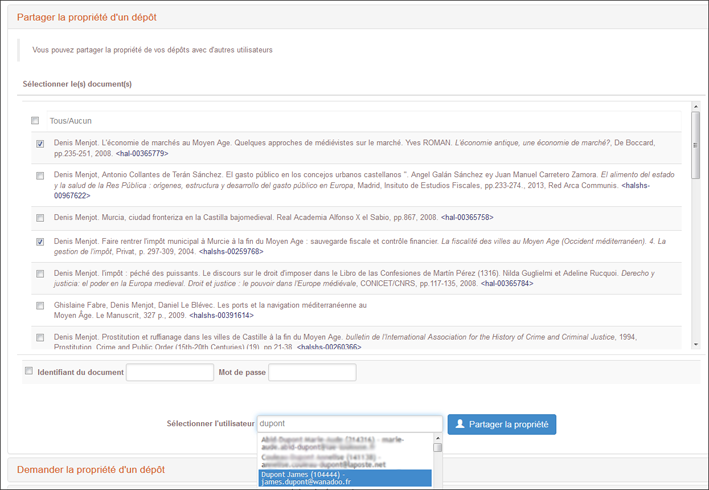 You will receive a notification by e-mail if you have chosen it in your preferences of mail proposed in your profile. The received mail will also allow you to report that you are not the author. To remove the deposit from your space, select it and then choose “Remove from my space” in the actions.